Hey Forza fans! Johniwanna here filling in for Mechberg who is enjoying a wet and wild Spring Break. We have a lot to share today, so I’ll keep this intro short so you can get right the Week in Review. 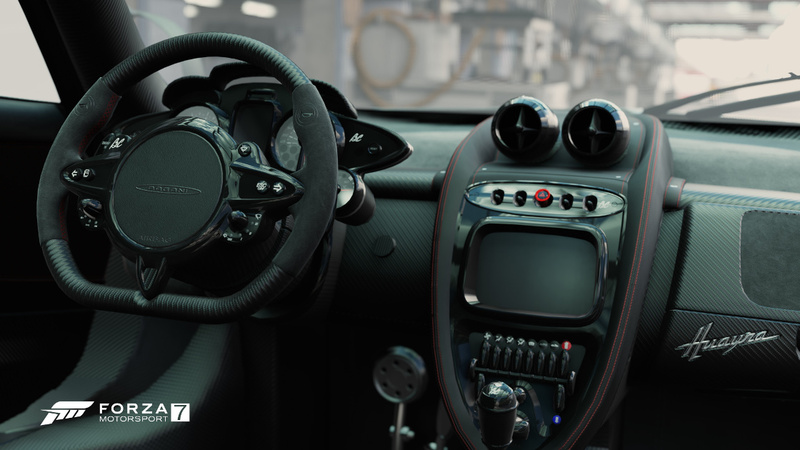 The April update for Forza Motorsport 7, originally planned for release on Tuesday, has been delayed due to a late-breaking issue that was discovered before launch. As a result we made the difficult decision to delay the update until we've corrected the issue. While we hope to launch the update next week, we don't yet have a firm timetable for launch. For the latest news on this update, please keep an eye on the official Forza Twitter account and/or our official Support Twitter channel. As always, thank you for your patience. ForzaRC casters Scott Cole and Alie Tacq were accompanied by professional racing driver and friend of Forza, Tanner Foust. The trio delivered blistering commentary on both the EMEA and NA ForzaRC Wednesday Showdown races. They shared the stage with a beautiful C7 LT8 Corvette Stingray convertible that Tanner gave us a little tour of during both shows. Now here are some highlights from those races, which you can watch in full below. EMEA coverage started with race two of three that were to take place. The car they would be racing was chosen by poll. When the votes were counted, drivers saddled up the awesome extreme street performance of the 1987 Ferrari F40 and the race took place at Silverstone. Over the course of eight laps it was Laige starting at pole after winning race one, bbb0x second, and Roadrunner third on the grid. Laige pushed out from the start and maintained his lead throughout the race to win again. The podium was filled by b0x and ASIX after Roaadrunner slipped back to seventh. The final race was a reverse grid and shook up the race order. It would be a test for Laige. Could he fight his way through a pack as well as he cuts through the clean air of a pole start? The answer was no, as the field took on the Nürburgring GP circuit for eight laps in the 2014 Honda #5 Zengo Civic WTCC. This is, of course, a FWD car, and a four-cylinder turbo in heavy contrast to the previous racecar used. Laige never got past anyone and ended where he started, in 12th. 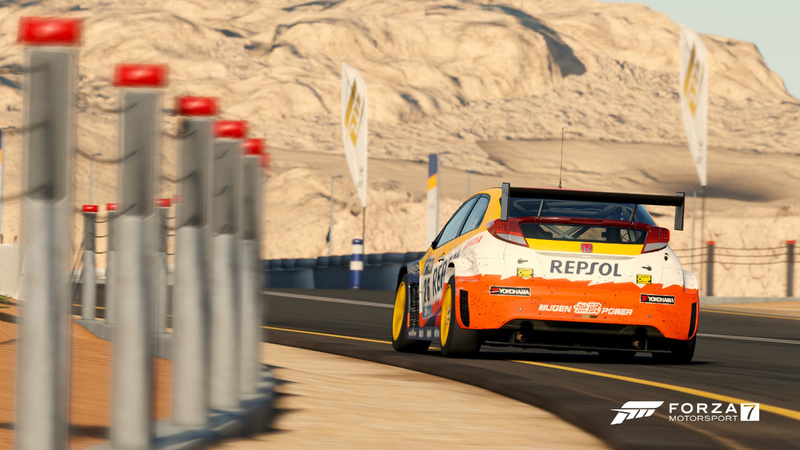 Driver b0x worked his way up to 8th but fell back again to remain 11th. The podium was held by Commando in first, Seven in second and ChemicaL in third. 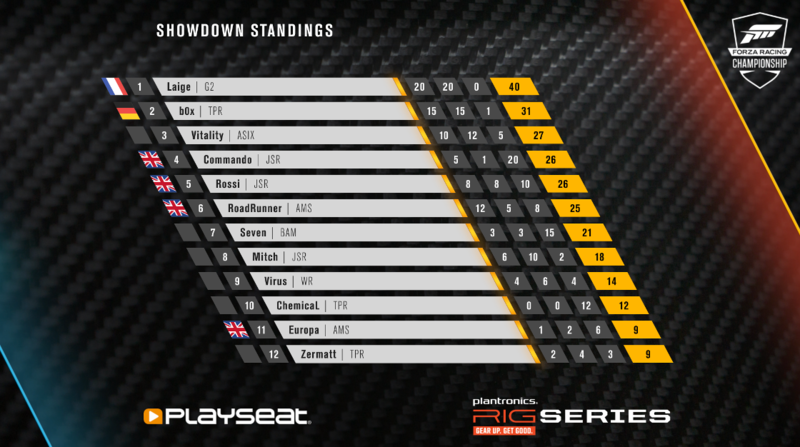 Check out the Round 1 Showdown standings for how it all added up. 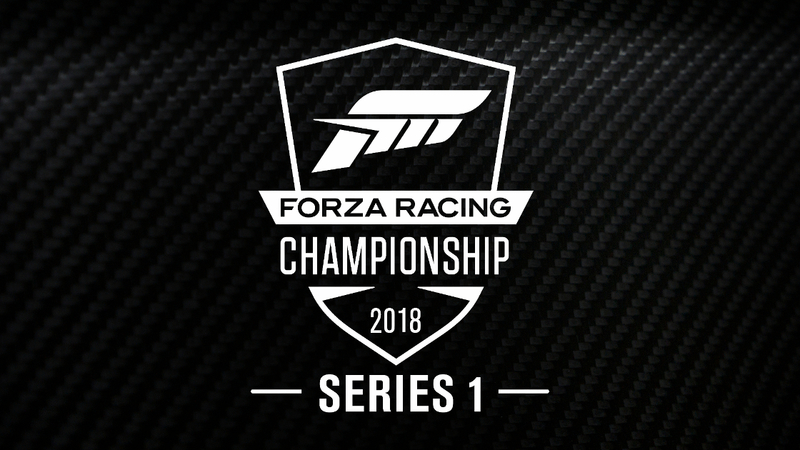 Or watch the EMEA races unfold here on Mixer. The North American racers started at Sebring for seven laps in the Corvette C7.R. The V8s rumbled as Lightning, Harmonic, and Bilysoo headed up the grid. As the race developed Diablo dropped out in between laps five and six. Bilysoo fell back to sixth then charged his way to fourth. At the end, the stage was set for what would be an epic battle between winner Lightning, second place Venom, with Harmonic coming in third. Race two was at Silverstone in the once again voter chosen Ferrari F40. That’s 680 horsepower in a package that has a very sharp edge. Lightning had the pole but lost the lead to Venom in the turn at Brooklands. Just a turn later at Luffield Lightning cut to the inside and gave Venom what later was adjudicated to be a slight bump and took it to a provisional win. Upon review, a five-second penalty was given to Lightning, which in turn gave Venom the win. Bilysoo, who at this point was a chat and caster favorite, nailed the third step on the podium. It was a crucial race and decision by the judges that left Venom and Lightning tied at 35 points apiece. For race three, Road America was voted as the place to race. Again, a reverse grid would test the leaders ability to challenge a field of racers. It was a fantastic race. If you can watch only one race from these two series, this is the one to watch. Unlike the EMEA leaders, who floundered in their attempts to claw their way up from the bottom of the grid, the American drivers fought their way out. It was a no holds barred brawl of clean and precise racing. Lightning battled his way to seventh, then to fifth, then to third with Venom right on his heels, and Bilysoo not far behind. If not for a bold move on Dr BecKx that resulted in carnage on the final lap, Lightning could have had second. Venom capitalized on his nemesis’ mistake and took second behind Vain. In the end, we have a first-time point leader in Venom, and the beginning of what should be an exciting rivalry. 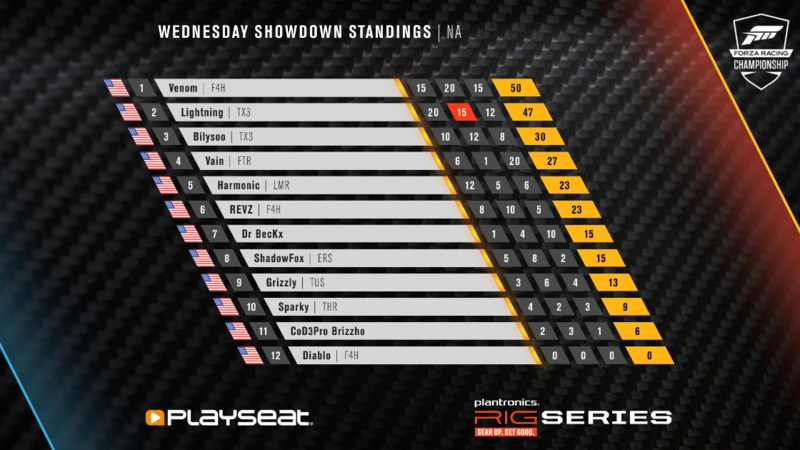 Bilysoo held his own for a fourth place that placed him nicely in the standings you see below. You can watch the whole NA series here on Mixer. 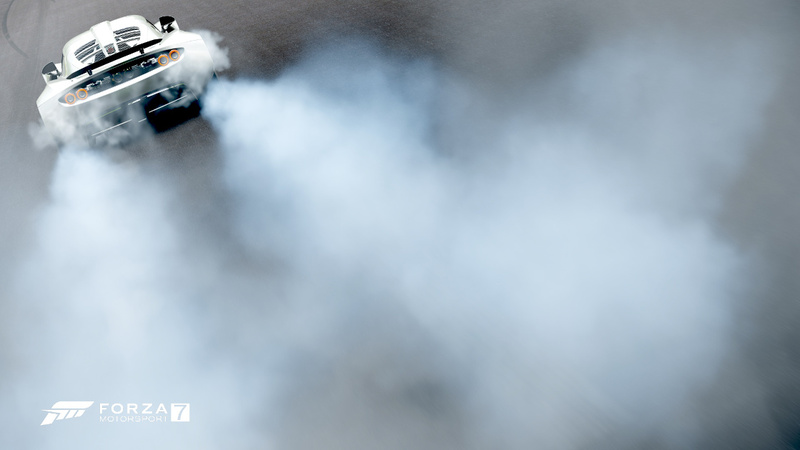 Just because the inimitable Tanner Foust has not yet set a time in his new Rivals event that is live now (as of this writing), doesn’t mean you can’t practice up. The event is a blast to compete in. Drive the Rockstar emblazoned Volkswagen Beetle he races in the Red Bull Global RallyCross on an interesting Dubai ribbon. 600 hp from an AWD 1.6-liter turbo? Come on, that has good time written all over it. Can you put all that power down through the twisting turning route? More importantly, can you best this top real-world driver? Get in there and see what you can do, Tanner thinks you have what it takes. You can earn the 1973 Pontiac Firebird Trans Am SD-455 if you beat him, or the Disco Driver suit if you get within two seconds. Plus, you will get the awesome 1995 Volkswagen Corrado VR6 just for putting in a time. On the #TuesdayDrive we had a tribute to “The Regulars,” who have been a part of the show as much as I have and we gave away a special limited-time livery from Noble WarWolf. On #WheelandPedalWeds I showed off a hot new Mountune livery for the Fiesta ST from BigDaddy5637 and we tried a tune that represents what a pending upgrade to my real life car might be like, and we did it in the rain. #ThingoThursday was hosted by Country Johniwanna and he busted out with his #catpants and a cowboy hat as we gave hide and seek a try in the Horizon’s Australia. Then we hit the countryside for some epic extreme cross-country racing. The finale of the week will be today on #ForzaFriday as I do my best to fill the immense shoes of Mechberg from 3-5 p.m. Pacific. I’ll just do my best. Count on a whacky Ring race in the least. See you there on Mixer. 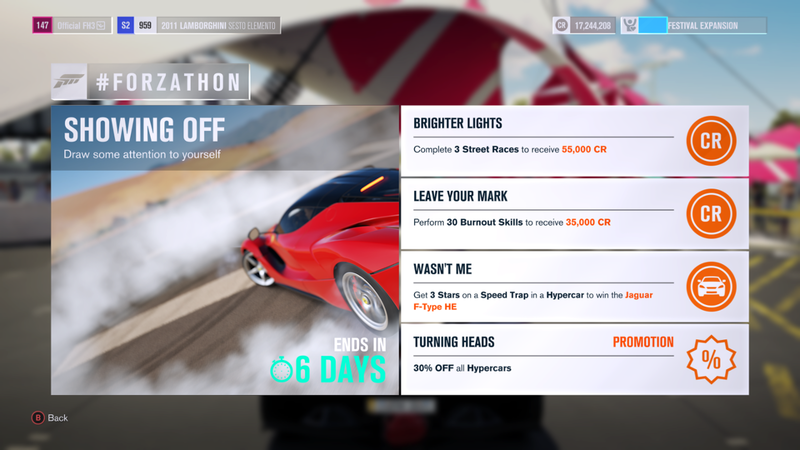 Among other things you can earn this week in the #Forzathon in Forza Horizon 3, the awesome Jaguar F-Type HE C-D is available, if you are fast enough. Can you turn heads while showing off and leave your mark? All I know is, it wasn’t me.